Based on dozens of interviews and extensive historical research, and spiced with interesting photographs, this entertaining book relates stories about mathematicians who have defied stereotypes. There are five chapters about women that provide insight into the nineteenth and the mid-twentieth century, the early 1970s, the early 1990s, and 2004. Activists in many fields will take heart at the progress made during that time. 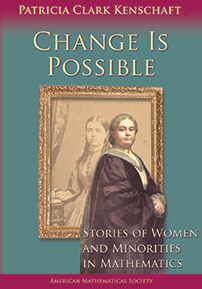 The author documents the rudimentary struggles to become professionals, being married without entirely giving up a career, organizing to eliminate flagrant discrimination, improving the daily treatment of women in the professional community, and the widespread efforts toward true equality. The stories of African Americans in mathematics include the efforts of Benjamin Banneker, an eighteenth century American who had three grandparents born in Africa. He helped design Washington, DC, and made the computations for almanacs that succeeded Benjamin Franklin's. There are stories about African American mathematicians who were students and faculty in late nineteenth century colleges and accounts of several efforts to integrate the mathematical community in the mid-twentieth century. These stories indicate that though some efforts were more successful than others, all of them were difficult. The book concludes with a happier chapter about five black mathematicians in the early twenty-first century. The book also includes five interviews with leading Latin American mathematicians, along with the results of a survey of Latino research mathematicians in the Southwest. The author is a skilled story-teller with good stories to tell. This book is a page-turner that all mathematicians—as well as others concerned with equality—should read. It is a work of great interest and an enjoyable read. Graduate students and research mathematicians; historians interested in mathematics. The role of minority and women mathematicians in developing our American mathematical community is an important but previously under-told story. Pat Kenschaft, in her highly readable and entertaining style, fills this knowledge gap. This valuable book should be in your personal library! ...the book is well written in a vivid style and the author has researched her subject well. Kenschaft reveals the passions that motivated past and present mathematicians and the obstacles they overcame to achieve their dreams. Through research and in-depth personal interviews, she has explored the sensitive issues of racism and sexism, rejoicing in positive changes and alerting us to issues that still need our attention.